Her sobs were louder than the cacophony of metal parts slamming against each other as our train sped southwards heading for San Diego. She just got off her phone and in between sobs she explained that she got a phone call from her mom saying her brother passed away. I wanted to tell her that I was exactly in her shoes two months ago when my father died... to hear her loss transported me back to that moment. I leaned towards the window trying to control the thoughts reeling in my head. I was ready to burst into tears but instead my eyes focused on the picturesque southern California sunset. It made me remember what my sister told me when I had a crying spell with her. She shared with me what the priest said in his homily using the sunset as a metaphor for death. Seeing the sun slowly disappear into the Pacific made me realize the profound meaning of the metaphor. The train ride home made me see the sun as it was slowly being tucked in... behind the cliffs and slowly beyond the horizon... its crimson rays gave a subtle warmth so comforting on a chilly November night... until it faded away and night fell. My family also had the opportunity to visit Papa in the hospital. My husband and 3 kids were able to come home, fulfilling a promise that they would come back and visit... and if there's a good thing about this is seeing how my Papa was loved and respected by family and friends. The extra care and attention that his medical team and the nuns running the hospital gave him, the constant influx of people showing up and sharing with us stories of how my Papa touched their lives and how they would come to him to seek his advice... simple gestures that gave us comfort. During the wake, people came with food... oh food, glorious food that I couldn't even count the calories I was eating... and how it was so comical even in between sobs, I would manage to eat and chew at the same time. I thought that was a skill, haha. No one is prepared to face the loss of a loved one, especially a parent. I wasn't. I'm not even going to explain to you the pain of losing him. And so I struggle and I begin to make things better. Slowly. I am accepting that he is gone yet learning to immortalize him in the precious memories he left behind, the wisdom that he shared and the beauty of the life he lived. This morning as the sun crept slowly in our room, I knew that another day is dawning... I remember my Papa would listen to his praise songs at dawn, closing his eyes, grateful that another day is here. He woke up every morning with a prayer and looked forward to a new day..... you would hear him cajole my Mama to wake up and cheerfully greet her "Good Morning 'Mi" like it was their first morning together. And if you didn't wake up on the right side of the bed, don't even dare show it to him, he will not be pleased, and you will hear him lecture you on the importance of having a good disposition in the morning. I'm glad that this morning I'm in a good mood, something that he will be glad to see... and especially if I had this breakfast spread for him... I can hear him say his usual compliment, "DABADABEST!". Mix all the wet ingredients and marinate the pork overnight. If short on time, you can also marinade it just before cooking. In a pan, put the marinated pork (with marinade) and add 1/4 c of water. Let it simmer until it's reduced and the sugar is beginning to caramelize. Add a spoonful of cooking oil to cook it further. My family wants it a little burnt on the sides but I leave it up to you... Voila, you're ready to enjoy a glorious breakfast. 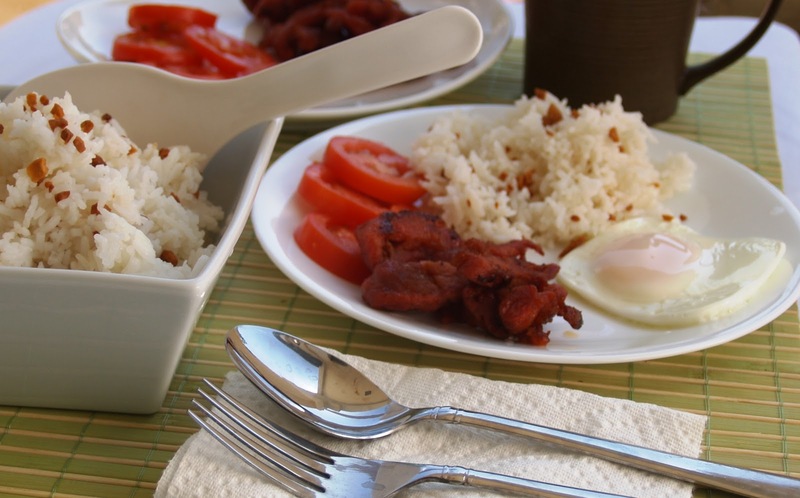 It's best served with garlic rice and sunny side up eggs, with sliced tomatoes and spicy vinegar for dipping. 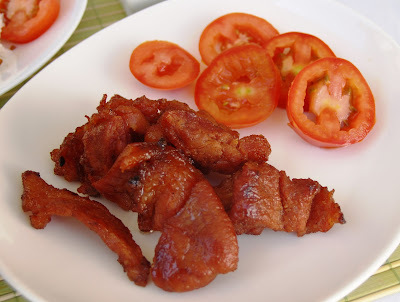 In order to get the authentic look of tocino, I added red food coloring. It doesn't add any flavor, but I was content that I got the reddish look that tocinos are known for. Glad you are back from blogging Malou. One of the very few I look forward to. I'm a fan, you know :) Someday, I'll try one of your recipes but for the meantime, admiration at the pictures you post in your blog are all I can do for now, he, he. Just one question, how do you figure out what to prepare for breakfast and dinner. I run out of ideas and I go to drive-thrus as a result. I try to get everything done during the weekends. My meals are always easy to prepare and on the fly. I don't have the luxury of time to do that. Thank you for the kind words. shoot me an email if you want some more tips on homecooking... but yeah thank god for drive thrus, they always come in handy haha! Glad you are back to blogging. 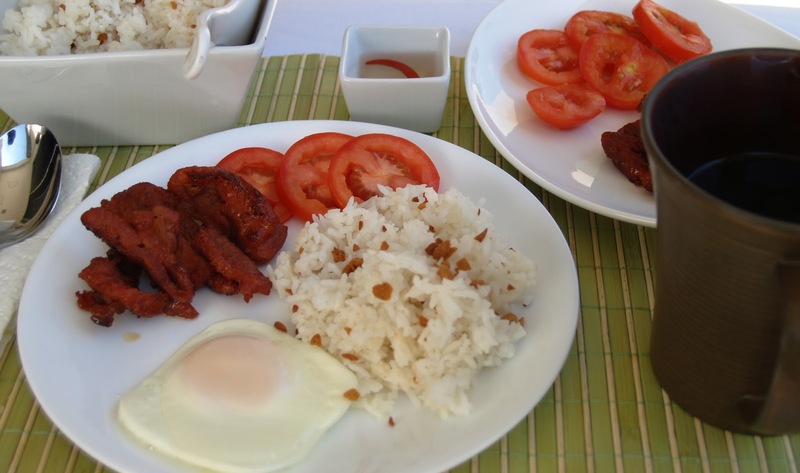 My kids call tocino the "red meat" really wonderful with atsara(picked green papaya and garlic rice. Tocilog is one of my favs. For the egg, I use a metallic pan or a regular carajay. The egg white cooks well with crispy edges. I find eggs fried in non-stick pans very gummy and rubbery. Beautiful post, Malou. I'm very sorry for your loss--I can only imagine how difficult it is to lose a parent. I did lose my grandfather earlier this year, though. A man for whom I had the deepest love and respect. I'm thankful to now able to remember the happy times rather than focusing on the pain of losing him. Your words conveyed a lot of your strength. I'm glad to hear about the love that is clearly not in short supply in your family. yay mom! you are blogging once again! i really like this post. your writing is impeccable. it makes me miss lolo and the philippines. but im glad that you have returned to the blogosphere. =)mmm now i want some tocilog. lol. So touching, Malou. I'm glad to see you're moving on. I've missed your blogs. You're such a talented writer. Thank you for choosing to showcase filipino foods. It's such a big help for us living abroad who misses the food we grew up with. Glad to have you back! Lou, many of us have lost a parent and are still hurting even after a long time. You're right - no amount of comforting could dissipate the pain. Yet, your 'sunset' story gives me a nice way to remember my dad and smile. Glad you're back. Keep blogging! hardhats: thank you for the warm welcome.. and hello it's great to meet you! Marie: hello welcome and great to meet you! Thank you for your suggestion. I don't want gummy textured egg too. But you know what I used the microwave for this sunny side up egg here. Caroline: aww my sweet Caroline you are.. thank you for being there for me all the time... hugs! Jean: thank you for the kind words, and I'm glad you found your way back here, with my domain change, I didn't expect to see familiar names again but happy to see you! Hi my nini-me! You surprised me for commenting in this site. You made me cry izzy.. I love you! Laura: You are one of my treasured friends and you know that... thanks for being there for me as always! Marife: of course kindred souls we are so much alike! thanks mucho for being so supportive! Oh Malou, thannnxx for leaving me a link and am so glad ur back here!! !THis one pulls a chord and more in my heart too, i know how this feels, the pain takes awhile to go but then the love is alwys there, when u look bakc all u will think is the love love and love and u already do too!!! Oh lemme catch up on the the delicious breakfast times , u made the tocinho? Hi Malou, I'm so glad you're back to blogging. Love this Tocilog but we usually have meat during lunch and dinner. I would like to try this for our next meal. I know I haven't been blogging and haven't visited your blog in a long time. But I just want to say welcome back to blogging. I know how it felt like to lose a father but I know you've been very strong. I did ask you about how you do your tocino. And this is better than adding the other preservatives that the school uses. Thanks for the beautiful post. Thank you for sharing this piece and such am intimate part of your life. I'm glad to be part of KCC and to be connected to bloggers like you. Malou, thank you for commenting on my blog to pull me to yours. Reading your post was a blessing, your words painting a picture full of color and deep emotion ... I don't think I will ever be able to see a sunset again without thinking of you, family, the importance of being grateful, an unbreakable marriage. I cry, but they are good tears. 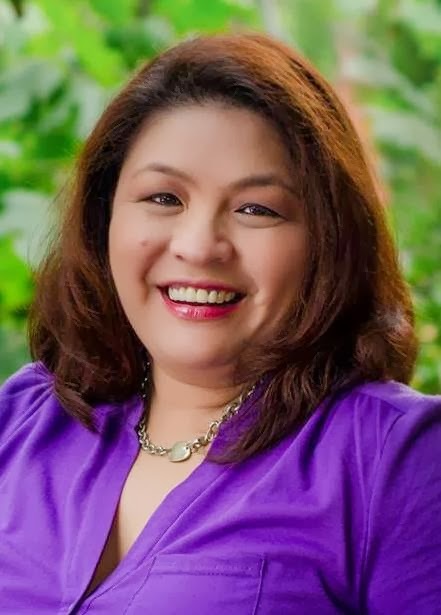 I'm so happy you're blogging again, Malou! We have missed you so much! There's something cathartic about writing. What a wonderful post, Malou! You're very fortunate to have spent time with your father before he passed away. I didn't have the same opportunity when my father left us three years ago. So glad that you're back to blogging, we have missed you! Mia: thank you... i missed blogging a lot because of people like you... good luck on the blog challenge you[re participating at. Ann: yes we eat pork and rice for breakfast. I know some people find it weird but we Pinoys do haha. Divina: The sherry does the magic.. no need to get those preservatives, which i m not fond of using either. Lala: im glad to meet you too. isn't blogging so great? Ninette: I follow your blog Ninette and I'm glad you found your way here too. I hope we will be traversing each other's space(virtual space that is!) and learn to know each other more! CHeers! Annapet: I went back because of you and the rest of the twitter friends... you've always been there for me and I could have not done any better. Salamat! I'm so sorry to hear about your dad. Hope you will be ok. I'm glad to see you back online and this delicious breakfast is lovely. would love to have this as breakfast! rebecca: great to see you... thank you for all the love and all the hugs and for all the sweetness haha! Natasha: thank you for the comforting words.. yes I will be ok.. well I have to be ok... but thank you! mr. pineapple man: so great to see you back. did you get my email? Glad to see you back blogging. Truly lovely heartfelt post. My best to you and your family. Sorry for your loss. That was a beautiful post - I'm so sorry to hear about what you've been going through the last couple months. Welcome back to blogging! I was so touched by your writing and your tribute to your departed father; this breakfast is an unusual but delicious one, to be shared with family and loved ones. I am sorry for your loss. I lost my Dad so what I do know is that there is a void that can't be filled but yet, we build in other ways that don't replace but do help. Thank you for sharing with us. It is good to have you back. No one writes like you do. What talent you have! Malou -- this post brought tears to my eyes. I felt very sad when I heard about your loss -- family is so important and it's nice to hear you were able to have your entire family in one place helping and supporting each other through a tough time. WAHHHHHHHHH!!! Oh goodness, Malou! This post had me in tears! I was all choked up in the first paragraph! I know this is an older post, but I'm still thinking of you. Thanks so much for the recipe! 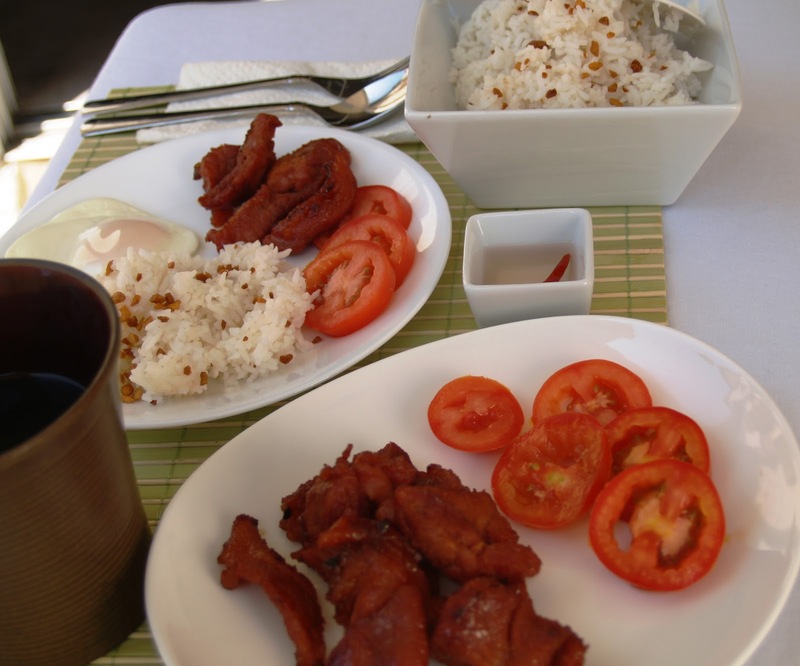 I made tocino with the Mamacita mix, but I wanted to make it from scratch! Thank you! !